I had a pretty bad week with Ruby on Windows 7 64 bit: I tried to set up DBI and ODBC on my work machine but I did not have any luck with that. I needed something to feel good about, so I decided to set up Jasmine BDD spec execution in the terminal on OS X.
I downloaded the standalone zip file from Jasmine's web site and made sure that the sample specs are executing fine with the SpecRunner.html file in the browser. I wanted to execute the exact same specs but instead of running it in the browser, I wanted to do it in terminal. Michael Hines' blog post was a pretty good starting point. He used JazzMoney, so I tried it myself. I easily found JazzMoney's installation instructions on their github page. It has prerequisites: I had to install harmony first. 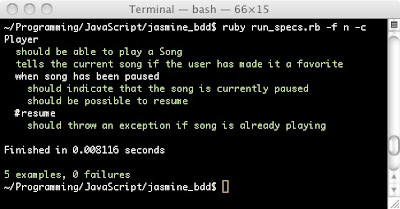 I picked ruby-1.9.2-head from RVM, created a new gemset called "jasmine" and I got started. Harmony has dependencies as well, I had to get stackdeck and johnson before I installed harmony. $ gem install johnson -v "2.0.0.pre3"
This is where it turned ugly. 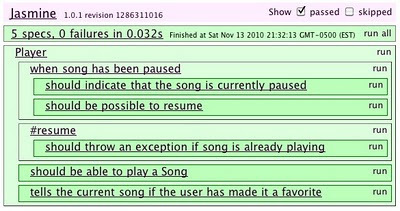 Stackdeck got installed fine, but johnson had some issues. After Googling the error I found out that johnson is not playing nice with Ruby beyond 1.8.7. 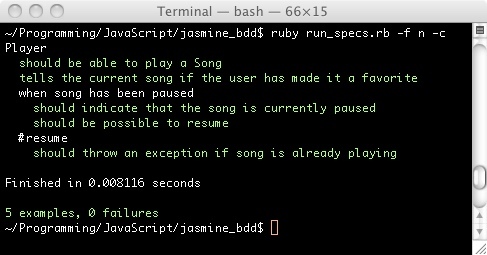 I went back to RVM and started out by installing a new version of Ruby. I did not have any problems with installing the gems under 1.8.7. I did one more thing: I created a shell script, this way I did not have to remember all the command line arguments. I can now invoke my specs by running "sh specrunner.sh" in the terminal. Worked great after I realized you were using the downloaded zip and not the Jasmine gem. Thanks a ton!